Spectacular works of art were excavated between 1986 and 1990 from burial mounds at Filippovka, in Russia, on the border of Europe and Asia. The objects were created from about the fifth to the fourth century b.c. by pastoral people who lived on the steppes near the southern Ural Mountains. The large funerary deposits include wooden, deerlike creatures with predatory mouths and elongated snouts and ears, overlaid with sheets of gold and silver, as well as gold attachments for wooden vessels and gold and silver luxury wares imported from Achaemenid Iran. These treasures are now in the collection of the Museum of Archaeology, Ufa, in the Russian republic of Bashkortostan. The discoveries at Filippovka open a new chapter in the history of the material culture of the nomads who in the first millennium b.c. traversed the steppe corridor extending from the Black Sea region to China. Yet the information provided by the Filippovka excavations is complicated and ambiguous. The identity of the people represented by the finds remains uncertain, but the forms and ornamentation of many works from Filippovka, as well as the cemeterys location in the southern Urals, argue for the cultural-chronological designation of this material as Early Sarmatian. Stylistic features, however, point also to the arts of Siberia, Central Asia, and China in the east and to the art of the Meotian-Scythians in the west. Imported Achaemenid goods raise questions about their place of production and about the circumstances that brought them to be included in tombs on the southern Ural steppes. Finally, robbers penetrated the burials in antiquity, destroying much of the evidence necessary for understanding the Filippovka nomads religious and funerary practices. 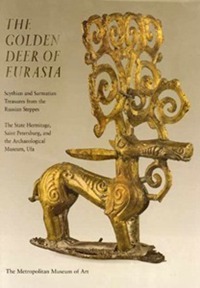 These are among the issues addressed in this volume, the catalogue for an exhibition at The Metropolitan Museum of Art that brings together the remarkable new material from Filippovka and, from the incomparably rich collections of the State Hermitage, Saint Petersburg, related luxury objects found in graves of other Eurasian steppe tribes. Gold and silver objects from the Scythian Black Sea tombs; textiles and leather and wooden works from the Altai Mountains; and gold and bronze pieces from the Caucasus, Central Asia, and Siberia illustrate developments in the art of the steppes in the centuries preceding the Filippovka burials, in contemporary societies, and in later centuries, toward the turn of the first millennium b.c. These outstanding works not only place the Filippovka discoveries in their proper historical and cultural context but are themselves fascinating and enigmatic. Joan Aruz is Acting Associate Curator in Charge in the Department of Ancient Near Eastern Art at The Metropolitan Museum of Art, New York. Ann Farkas is Professor Emerita in the Department of Anthropology and Archaeology at Brooklyn College of the City University of New York. Andrei Alekseev is Head and Senior Researcher and Curator in the Department of Archaeology at the State Hermitage, Saint Petersburg. Elena Korolkova is Senior Researcher and Curator in the Department of Archaeology at the State Hermitage, Saint Petersburg.